In a year when arts organization are struggling, looking for safe family entertainment to attract patrons, it's clear that the name Shakespeare is still magic. 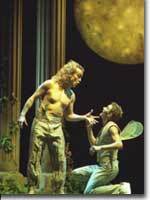 And at the top of the general audience Shakespearean repertoire sits A Midsummer Night's Dream. A couple of months ago we saw an idyllic production of this work by the Colorado Ballet; next week we'll see it performed by the Colorado Shakespeare Festival; and last week we saw a remarkable production by the Central City Opera. Combining the talents of an outstanding cast, a virtuoso performance of Benjamin Britten's score by the festival orchestra directed by Hal Prince, polished ensemble work by the Colorado Children's Chorale, stylish costumes by Alice Marie Kugler Bristow, painterly lighting effects by David Martin Jacques, and set against his own Maxville Parish inspired set replete with phosphorescent dragonflies and fairies, director and scenic designer Paul Curran has come up big in his debut at the refurbished 124 year old opera house. In no production of this classic have I seen a more physically attractive and perfectly matched Oberon and Tytania than in David Walker and Anna Christy. Walker's countertenor and Christy's soprano, both recently heard at the New York City Opera, make their repartee a joy. Patrick Carfizzi handles the central comedic role of Bottom with aplomb until he is upstaged, in the final "Rustics" scene, by Lawrence Bianco's Flute, whose Joan Sutherland send-up had us laughing until we cried. If you're looking for a way to introduce the kids to opera or just plain enjoy it on it's own terms, Central City Opera's A Midsummer Night's Dream is a winner. It runs in repertory with Carmen and Summer and Smoke through August 8th. 303-292-6700.